Hannover Zoo: STOP exploitation of baby elephants.ONLY PROTECTED CONTACT! NO bullhooks, NO circus tricks! Secret images have revealed how baby elephants are forced to learn tricks to perform and to entertain the audience, at the hand of a painful tool, named a bullhook. This doesn't take place in Thailand, India or Sri Lanka, where it is still practised as part of the Phajaan ritual to break the spirit of the elephant in order to make him or her fear and obey humans. World wide numerous efforts are being taken to stop this cruel tradition and abusive practise. Now we see the same thing happening in a European Zoo: the Hannover Zoo. The need for a zoo is already questionable as it concerns big animals like elephants, who have a complex social family life and who have the need to roam free over big distances. Their welfare is always at risk in most of the zoos, who can't provide in these needs. As this isn't enough, this zoo management thinks it is all right to handle those baby elephants in a way that is being used in circuses as well. Let us make a clear statement: A ZOO IS NOT A CIRCUS! A ZOO HAS TO BE A LEADING EXAMPLE OF REAL EDUCATION ABOUT WHAT THE PLIGHT OF THE ELEPHANT IS IN AFRICA AND IN ASIA: THERE IS THE POACHING CRISIS FOR IVORY AND THERE IS THE EXPLOITATION FOR HUMAN GREED, IN CEREMONIES, IN PARADES, IN THE TOURIST INDUSTRY, CIRCUS INDUSTRY, ETC.... BY APPROVING THIS KIND OF TRAINING IN THE ZOO, WHERE THE ELEPHANTS HAVE TO PERFORM STUPID TRICKS FOR THE UNEDUCATED AND IGNORANT TOURISTS, YOU GIVE THE VERY WRONG MESSAGE THAT EXPLOITATION AND PHAJAAN TRAINING, AND THE USE OF THE BILLHOOK IS OKAY! YOU ARE VERY VERY WRONG IN THIS! A BULLHOOK INFLICTS PAIN AND IS ALWAYS ASSOCIATED WITH IT, IT IS A TOOL THAT NEEDS TO DISAPPEAR AS IT IS A DISGRACE TO THIS MAJESTIC, INTELLIGENT AND SENTIENT ANIMAL THAT HAS ALREADY BEEN ABUSED FOR AGES. WE DEMAND AN IMMEDIATE STOP OF THESE USELESS TRAININGS, TO PRACTISE PROTECTED CONTACT, TO IMPLANT POSITIVE TARGET TRAINING, TO STOP THIS ABUSE. TAKE AN EXAMPLE OF HOW THE ELEPHANTS HAVE DIGNITY AND RESPECT IN THE ZOO OF PLANCKENDAEL IN BELGIUM WHERE THE ELEPHANTS ARE LIVING IN A HERD AND ARE NOT HUMILIATED AND EXPLOITED. 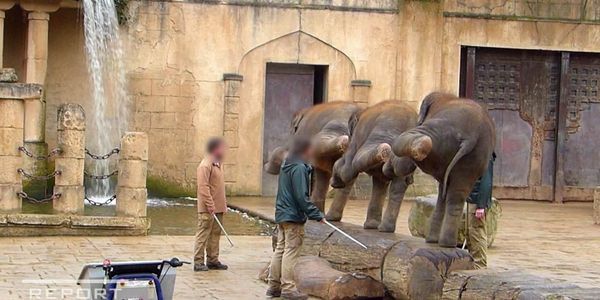 Please sign our petition to demand that the Hannover Zoo in Germany STOPS this abuse and exploitation of baby elephants! New undercover footage shows there is still abuse with the bullhook. Elephants show distress when keepers entering their enclosure. Purpose: no more bullhook but protected contact, leave the elephants alone.